Not only is Penclic Mini Keyboard stylish and attractive, the tonality and design is also of importance for your wellbeing. The keyboard gives off minimal reflection, and usually matches the colour on your computer screen. This is a visual ergonomic improvement, implemented to enhance user experience. The contemporary and relaxing colours make the keyboard as easy on your eyes as it is on your fingertips. 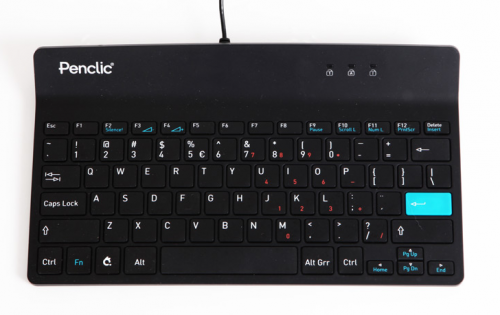 Penclic Mini Keyboard is offered in two models, a wireless K2 and a corded C2. Special functions (blue text) are activated by holding the Fn key and then pressing one of the keys showing in the picture to the right. 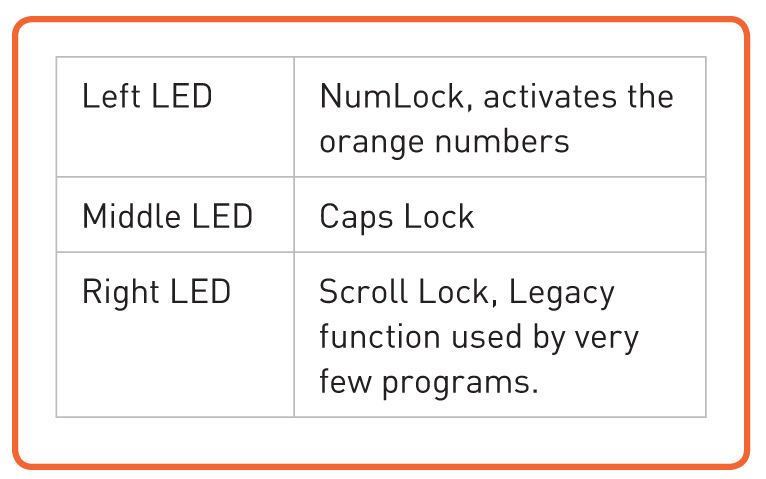 Num Lock actives the numpad funtions which is the smaller orange numbers. Penclic Mini Keyboard K2 (wireless) has 1 LED indicating battery status. Penclic Mini Keyboard C2 (corded) has 3 LEDs. Base: 285 x 162 mm | 11.23" x 6.4"
How do I get Penclic Mini Keyboard to work with my computer? Simply connect the corded Penclic Mini Keyboard to the USB port. To setup the wireless Penclic Mini Keyboard insert the rechargeable batteries and start charging with the included micro-USB charging cable. Insert the Nano-USB receiver into the USB port, then set the keyboard power switch on the bottom of the keyboard to ON. The wireless connection activates automatically. For both models the driver installation starts automatically. How is Penclic Mini Keyboard suited for my needs? The compact size and low keys allows a more centred and healthy working position. Penclic Mini Keyboard's normal size keys provide a good tactile feeling which results in a quick response when typing, creating a relaxed and efficient time in front of the computer. The contemporary and relaxing colours make the keyboard as easy on your eyes as it is on your fingertips. This is a visual ergonomic improvement, implemented to enhance user experience. 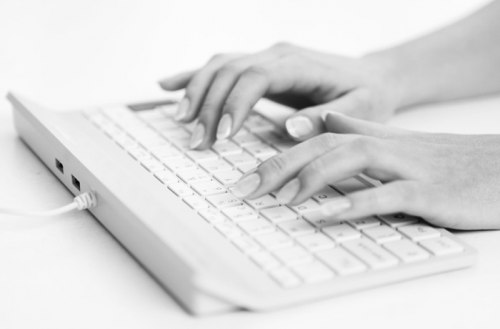 What problems may Repetitive Strain Injury (RSI) cause? RSI is an injury of the musculoskeletal and nervous system that may be caused by repetitive tasks, forceful exertions, vibrations, sustained or awkward positions. Problems with the neck, shoulders and hands can occur due to highly controlled, static, monotonous, repetitive work. Which operating systems does Penclic Mini Keyboard work with? The supported platforms for Penclic Mini Keyboard are all operating systems that support HID 1.1. These includes Windows XP or later, Mac OSX version 10.1 or later and most Linux/BSD flavors. MAC operating systems do not support all the special functions. Do you need any extra software? No extra software/driver installations are needed. What features does Penclic Mini Keyboard have? It is a slim, 5 mm in profile keyboard with normal sized scissor keys. The keys are also low Quiet-touch. 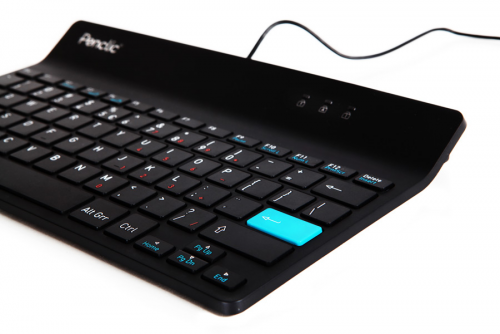 The corded Penclic Mini Keyboard has 2 USB-port. For the wireless keyboard rechargeable batteries and a micro-USB charging cable are included. How do I easily work with numbers? As with an ordinary sized keyboard you have all the numbers above the letters. Also, the smaller orange numbers is the numpad and you activate them by pressing Fn and Num Lock (F11) at the same time. Do the keyboard have any extra functions? Everything in blue text is special functions and is activated by holding the Fn key and then pressing the key. See the different functions below. How do I know when the batteries need to be recharged? 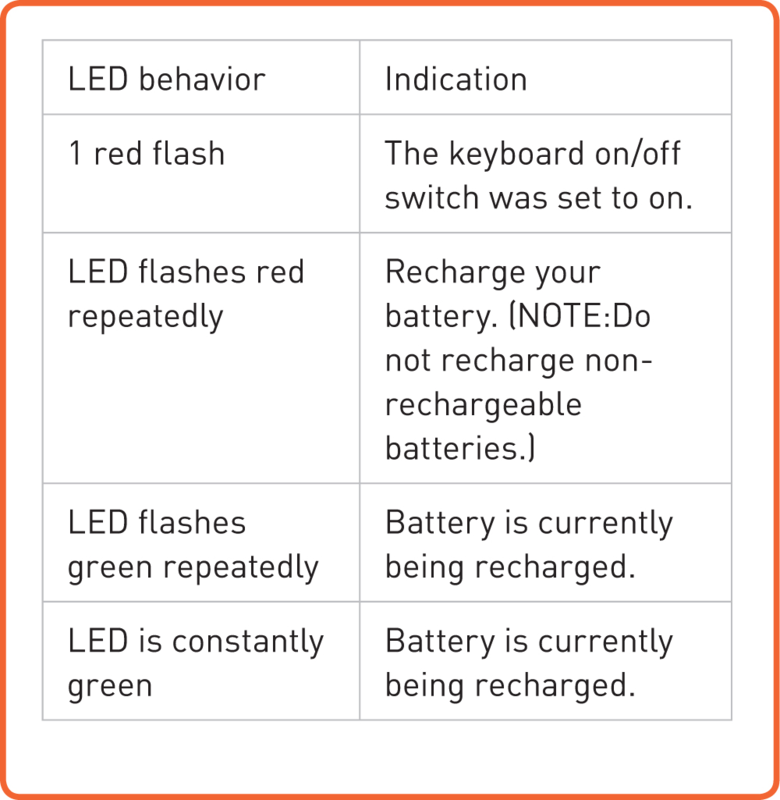 When the battery needs recharging the LED on the keyboard will flash red. When the battery is fully charged a constant green light will be displayed. With everyday usage the battery will last approximately 2 months before recharging is needed. Remember to recharge the battery before you use the keyboard the first time. What kind of battery is it? A rechargeable AAA 1.2V NiMH battery is included with the wireless Penclic Mini Keyboard. None rechargeable AAA batteries can be used as well, LR 03/AAA/1.5V Alkaine. NOTE: Do not try to charge non rechargeable batteries. How far away does the wireless keyboard work? The wireless Penclic Mini Keyboard minimum reaches 5 metres. How long is the cable for the corded keyboard? The cable for the corded Penclic Mini Keyboard is 1.4 metres in length. What can I do if I lose my recharging cable? It is a standard micro USB cable and the keyboard will work with your standard one. "I certainly liked the Penclic Keyboard due to the fact that it was low profile and had good tactile feeling. Also being in such small size. Before we had tried the Penclic Keyboard, we had invested in an angled laptop stand which contributed to a complete wrong angel for the wrist. Now with the Penclic Keyboard, we have found a really comfortable visual- and ergonomic working position by combining the keyboard and our monitor in a certain position. I will certainly recommend this working position to my customers during my work as a visual ergonomics consultant." Computer use may be linked to serious injuries or disorders. Long periods of repetitive motion, may cause you to experience occasional discomfort in your hands, arms, shoulders, neck or other parts of your body. If you experience symptoms such as persistent or recurring discomfort, pain, throbbing, aching, tingling, numbness, burning sensation or stiffness, DO NOT IGNORE THESE WARNING SIGNS, SEE A QUALIFIED HEALTH PROFESSIONAL. 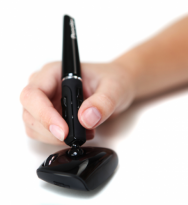 Penclic AB is not responsible for any disorders or injuries associated with computing activities. Risk of explosion or personal injury if batteries are replaced by incorrect type, mutilated, or exposed to conducting materials, liquid, fire, or heat (above 54 C or 130 F). Do not use or recharge damaged rechargeable batteries. You are obliged by your government to dispose of your electronic waste separately from regular waste. Contact your local disposal/recycling center to get information on proper disposal procedure. Penclic AB, Vendevägen 90, 18232 Danderyd Sweden herewith declares that the Computer accessories with the brand name Penclic are in conformity with the provisions of the following applicable directives of the European Parliament and European Council: Radio and Telecommunications Terminal Equipment (R&TTE) Directive 1999/5/EC of 9 March 1999. The product is in conformity with the following standards and/or other normative documents: SPECTRUM (Art. 3.2 of R&TTED): EN 300 440-1 v1.4.1 (2008-05) & EN 300 440-2 v1.2.1 (2008-05) EMC (Art. 3.1.b of R&TTED): EN 301 489-1 v1.8.1 (2008-04) & EN 301 489-3 v1.4.1 (2002-08) HEALTH & SAFETY (Art. 3.1.a of R&TTED): SAFETY: EN 60950-1 (2006) + A11 (2009) [Class 1 Laser product] Electromagnetic Field Human Exposure: EN 50371 (2002). 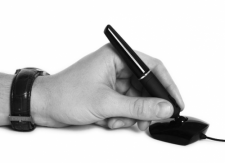 Penclic AB warrants that this product will be free from manufacturing defects for a period two (2) years from the date of purchase by an end-user customer ("the Limited Warranty"). This Limited Warranty is limited to replacement or credit, at Penclic AB's option, upon return of the defect product, along with original receipt of purchase, to the place of purchase. This Limited Warranty does not cover damage from every day wear and tear or from transportation. This Limited Warranty applies only if the product (1) is used according to the instructions furnished by Penclic AB; (2) is not misused or abused; and (3) there is no evidence of tampering, mishandling, neglect, accidental damage, modification or repair without the approval of Penclic AB or damage done to the product by anyone other than Penclic AB. PENCLIC AB DISCLAIMS ANY EXPRESS WARRANTY NOT PROVIDED HEREIN AND ANY IMPLIED WARRANTY, GUARANTEE OR REPRESENTATION AS TO SUITABILITY FOR ANY PARTICULAR PURPOSE, PERFORMANCE, QUALITY AND ABSENCE OF HIDDEN DEFECTS, AND ANY REMEDY FOR BREACH OF CONTRACT, WHICH BUT FOR THIS PROVISION, MIGHT ARISE BY IMPLICATION, OPERATION OF LAW, CUSTOM OF TRADE OR COURSE OF DEALING, INCLUDING IMPLIED WARRANTIES OF MERCHANTABILITY AND FITNESS FOR A PARTICULAR PURPOSE. EXCEPT AS PROVIDED HEREIN, PENCLIC AB FURTHER DISCLAIMS ANY RESPONSIBILITY FOR LOSSES, EXPENSES, INCONVENIENCES, SPECIAL, INDIRECT, SECONDARY OR CONSEQUENTIAL DAMAGES ARISING FROM OWNERSHIP OR USE OF THE PRODUCTS. CA 2578208 A1, CN 101040236 B, EP 1203290 A1, EP 1615096 B1, JP 4227744 B2, JP 2008/506170 T2, KR 2007/0039133, SE 521526 C2, US 6762750 B2, US 2008/0225003 A1, WO 01/01233 A1, WO 06/05523 A1.